Technology bridged the divide for schoolchildren in Parma, Italy, to interact with Emporians on Friday. Kitty Frank of Allen has volunteered as a Granny in the Cloud since 2014. She spends one hour each week online with a small group of students in Italy. On Friday, Frank conducted her session at the Emporia Public Library so others could share the experience. 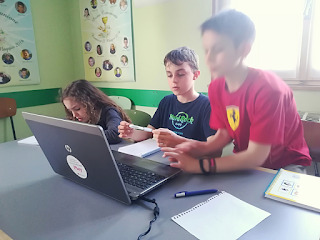 The students voluntarily participate in the School in the Cloud as part of an after-school program facilitated by Riccardo Lodi. 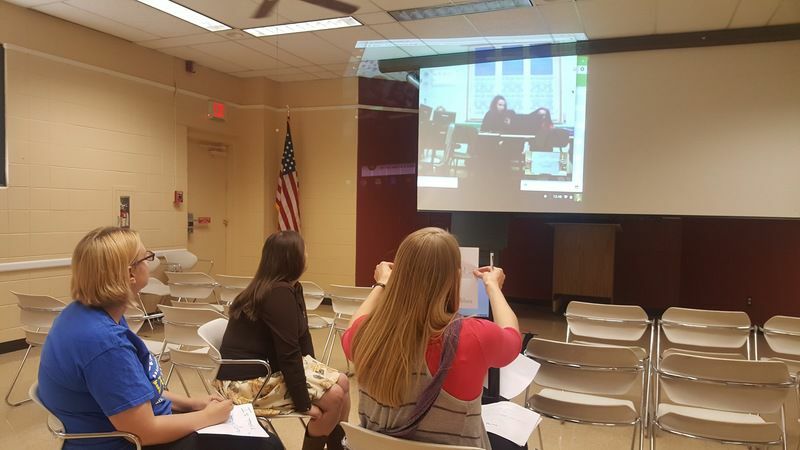 The students returned to school at 6:30 p.m. to participate in the Skype session with Franks. During the session, students are given questions to challenge them. They translate the question, research the answer and then practice their English by communicating the answer to Frank. Frank has also taken the students on “virtual field trips” through downtown Allen and on a tour of Main Street. Next week the children will visit the David Traylor Zoo. During Friday’s session, attendees at the library also asked questions of the children. Is there a library in Parma? The students advised there is not one library but 32 libraries in the city. Is there a newspaper in Parma? Yes, the Parma Gazette which was founded in 1735. The Granny in the Cloud program stimulates children’s curiosity, develops their confidence and exposes them to people and worlds beyond their context. The program also fosters independent thinking, improves English conversation and encourages lifelong learning. All while the children laugh and learn together with one another and Frank. The group has grown considerably since 2014. As more children become interested in joining the program, the need for volunteer Grannies increases. Frank said volunteering as a Granny has been rewarding. She enjoys interacting with the children and she too has learned from the experience. She encourages others to get involved. If interested in volunteering as a Granny in the Cloud, contact Lodi about opportunities at the school in Parma by emailing lodiric@libero.it.